This is an arrangement I did for the Independent Floral Designers Association table at Potomac Floral for their annual flower show in March. 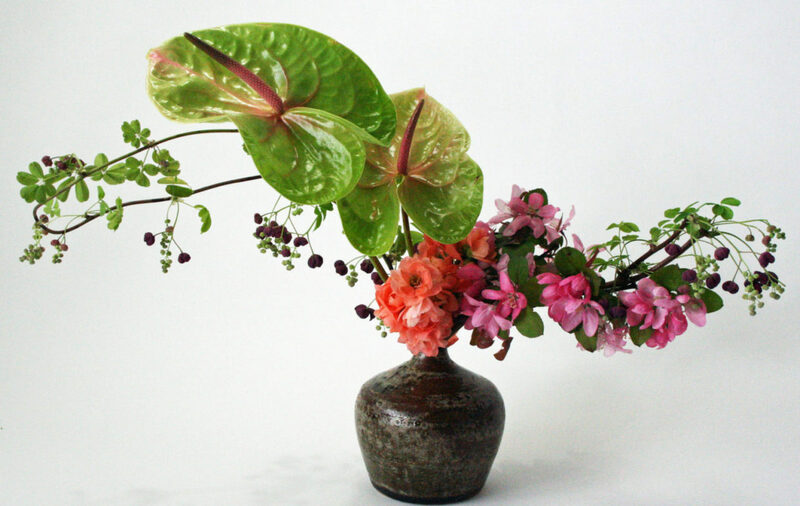 I thought it would be a good chance to do something that was ikebana inspired using a basic ceramic container and floral foam. 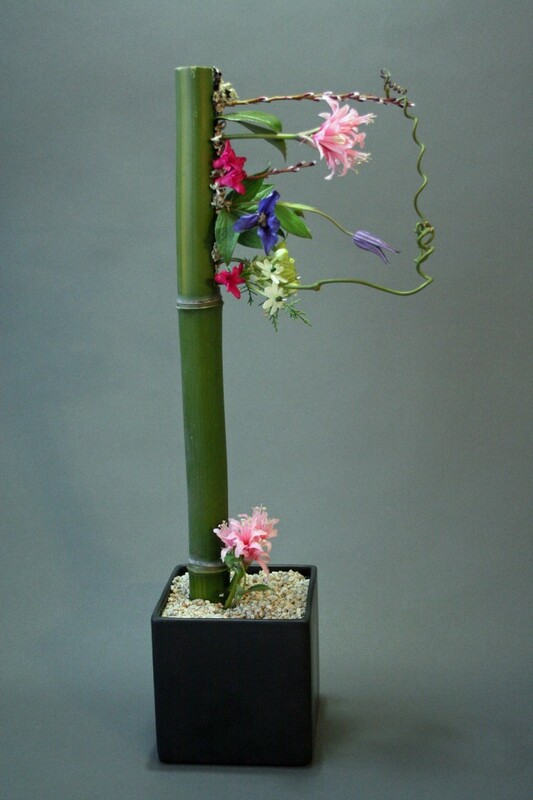 My only limitation was that it could be no more that a foot wide, but it could be tall and use any materials or style I wanted. 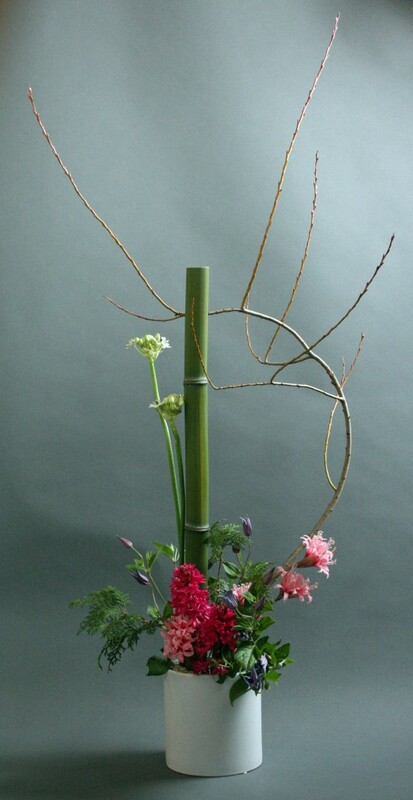 For my floral material I gathered a piece of fresh bamboo,some fasciated willow and cedar here at home. Then a trip to Potomac Floral where I bought some dark blue Japanese clematis, hot pink hyacinth, arabicum, light pink nerine lilies and galax leaves. It was designed very closely to the sketch I made, but later I began to wonder how I could have made it different. So after the show I made another variation using the same materials. The second version is definitely more minimal, with very delicate use of materials. The final version uses a woven midelino spiral to make it a little more contemporary. Other than the midelino the materials are the same as the previous versions. I always deconstruct what I have done in my mind, trying to figure out how I could have improved the design or done it differently. This was a chance to work with those ideas and show my work. Thank you Keith, interesting study. The second variation is my favourite – the one with a rectangular frame on top. I like the colours and the clean look. Thank you Ekaterina, I think the second on e is my favorite too. Clean lines and clear intention. How wonderfully inspiring. I believe you saved the best till last. A flame of blue from the burning torch is fabulous.